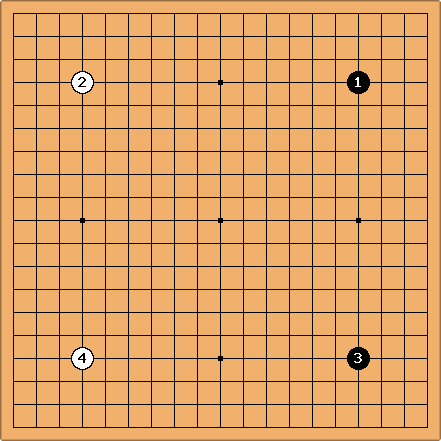 Games reaching this position after four plays were seen in the Shin Fuseki period, but this opening only became fashionable around 1990. 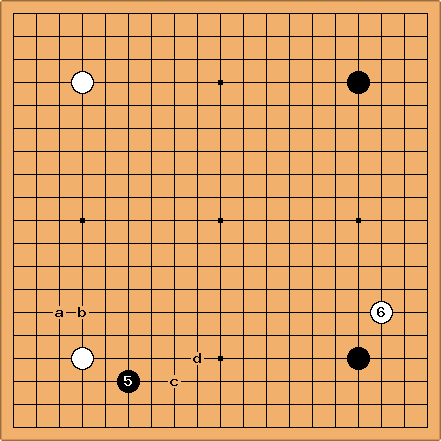 Black came to avoid sanrensei, playing 5 here: to which the common answers are a to d. These are now all thoroughly researched, to the extent that that has any meaning for go openings (fuseki). 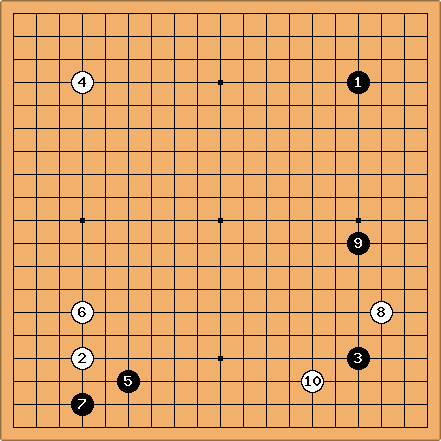 Artus: So where to find discussions of the Joseki to expect in this position? The fashion for this opening only died down when interest moved to mini-chinese patterns a few years ago. Daniel: Why can't white play at e? Uwe: I have not found any pro game where was played in this position. What is wrong with this move? 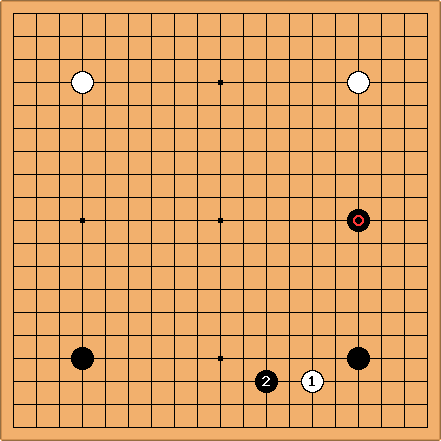 Charles Matthews If Black plays simply on the right, and then makes a double kakari on the left, this is surely an adequate result for Black. Kris: Some discussion of the relative merits of the lettered responses by white would be welcome. Discussion of responses not listed is welcome as well. Charles While is not common, there have been a few pro experiments with it. Next (j) and are the expected plays. 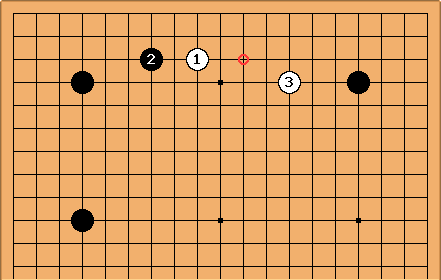 When I see plays like in club games, I tend to assume they derive from server play; they aren't really orthodox, classical play because you can't say that they have a strategy behind them. That being said, will probably invade the corner now, and Black will get some early influence. Bill: I think that there are still a lot of good plays after . I have added k through o, for example. Which to play is largely a matter of style, I think. Moi, I like a wedge. 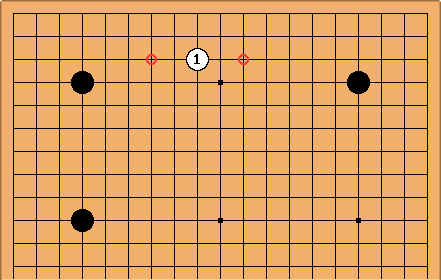 Maybe k. The asymmetrical wedge when the opponent has extended on one side is an idea I got from Sakata. Charles I presume Bill means this . This is one of the options for this pattern (though the approach is more popular by a factor of around 20). Next Black at one of the circled points is expected. This sort of thing happens in Takemiya games of the 1990s. 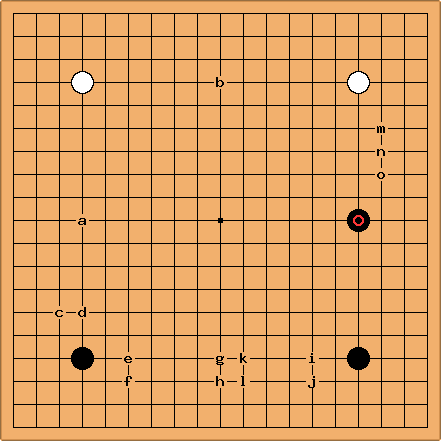 Black may invade immediately at the circled point. By way of an example of nirensei vs. nirensei, here's Cho Chikun as black vs. Kato Masao in Oza 1994. 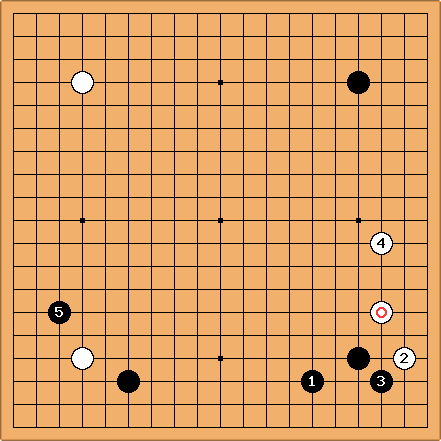 Black wins by resignation.